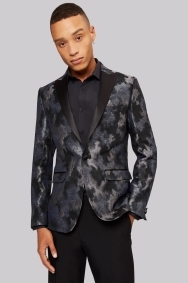 This jacket will go down a storm at your next party. 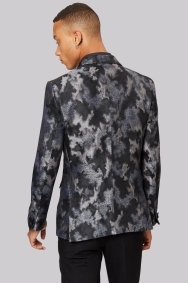 Get noticed in this bold jacket by Moss London, featuring a striking mottled print in grey tones. 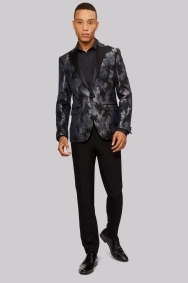 It’s made for nights out with the sheen in its fabric and silken peak lapels. 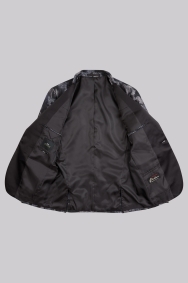 Cut in a slim fit, it carves out a crisp outline with a narrow shape through the shoulders, chest and waist. Team with a pair of smart black trousers and an open necked slim fit shirt, preferably in a dark shade, for a laidback take on a dressed-up outfit. Decent quality (could have better construction). Mega comfy ever! Love it, ! Feel real gentleman! Quality and fit excellent. True to size and lovely material. good price - but too short on the sleeves! looks great, quality if great, superb!